Online ordering menu for Leo's Coney Island (Davison). 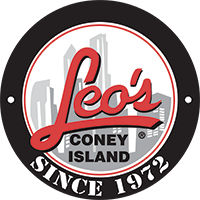 Leo’s Coney Island has evolved from a limited menu offering the basics of Coney Islands, fries, burgers, and Greek Salad--to a wide selection! Our menu offers a full line of items for the whole family, including Greek Specialties, Breakfast, and a Kid’s Menu. Today, Leo’s Famous Greek Salad Dressing can be found in specialty markets and local grocery stores. However, throughout the years Leo’s has not strayed from the formula of serving the highest quality products and giving great service to customers. Leo has made it his mission to provide the experience of a Coney Island, while also offering delicious homemade soups and family favorites. Find us near the corner of N. State & W. Bay, across the street from Kroger & Dollar Tree. Order online for carry-out today!